December 20th 2018. 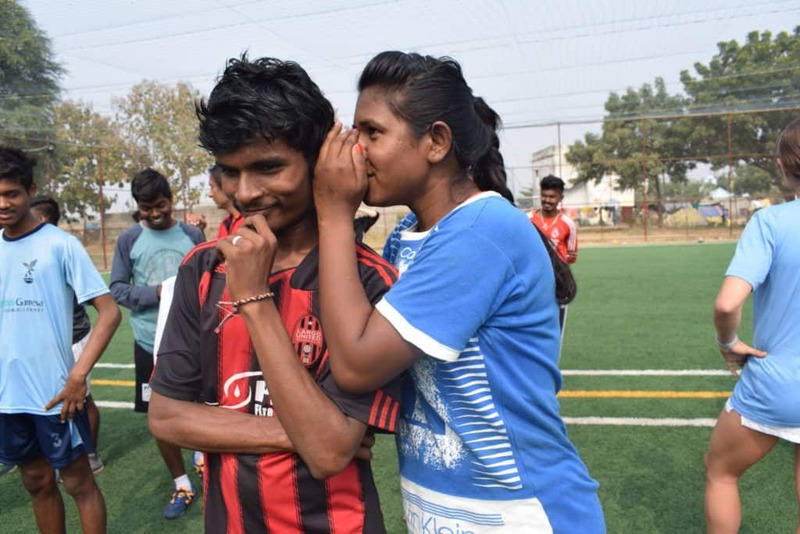 CAC Global Citizen Jesse DiLuzio blogs from Nagpur, India about our On-Field week with longtime partner and inaugural FIFA Diversity Award winner Slum Soccer. Upon leaving the airport in Nagpur, India you encounter what I, based on my limited experience in India, call “classic India”. Unfinished roads overpopulated with honking vehicles, massive cows snacking on mounds of trash, and a musty air that fills your nose with an undesirable stench. While this “classic India” of mine is certainly not a fair representation, after a week in the overcrowded chaos of New Delhi, these are the things you become accustomed to. Therefore, I was quite relieved when we drove past the industrial madness of Nagpur into the rural are of Maharashtra. Maharashtra is a small town that, upon first glance, lacks any distinctive features. There is one long, bumpy road that runs through the village flanked by a combination of small food stalls, large cows, underdeveloped homes, and small tents which sit on a ground of dust and rocks. So, you can only imagine our surprise when we first encountered the turf field that sits in the middle of this underdeveloped region. This field, surrounded on all sides by a large chain linked fence, belonged to Slum Soccer, the partner that Coaches Across Continents was set to work with that week. While I didn’t know this at the moment, this 30 x 60 piece of turf is way more than just a football pitch. Slum Soccer was started around ten years ago by a university professor named Vijay Barse, who we were fortunate enough to meet. After watching kids play soccer with a broken bucket in the slums, he was inspired to set up a tournament for them so they could enjoy competition in a more formal setting. As time went on, this tournament turned into weekend sessions for the local community. Today, Slum Soccer provides educational/healthcare workshops, societal developmental programs, coaching camps, and the pure joy of a place to play football to nearly 70,000 men, women, and children across 63 districts in India. This meteoric rise from a fun football tournament for a few to an empowering resource for thousands can best be summarized in the stories of the people who work for Slum Soccer. One such person is a young man named Homkant from Northern India. As a child, he grew up during the heat of the ongoing tensions between Hindu and Muslim groups in India and Pakistam. Amidst the tensions and dangers of the violence that plagued the region, Homkant was pressured to join the Hindu side. Caught between attacks on Islamic holy sites and the defense of his own sacred temples, he called this period of his life the “darkest chapter”. In the face of problems in his own home and with the local police, he left everything behind to start a new life in Nagpur. However, this “new life” was far from lucrative. He spent one year living on the streets before picking up a job at a local tea stall. This is when Slum Soccer stepped in. Without passing any judgment, the individuals in Slum Soccer found Homkant and provided with a home, three meals a day, and an opportunity to learn and build within the beautiful game. 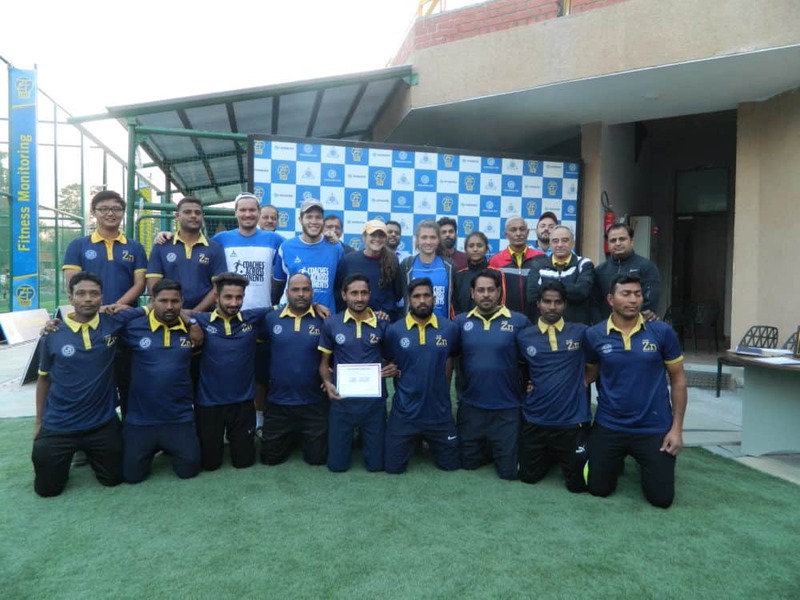 The pinnacle of this experience was being selected to represent India in the Homeless World Cup. Following these life changing moments, he has now dedicated himself full time to the organization. He is constantly running trainings and educational programs, recruits players for the Homeless World Cup and is looked up to like a big brother by the others in Slum Soccer who have also been helped off the streets. Across Slum Soccer, you can find many stories similar to that of Homkant. Stories of struggle, strife, and a rebirth supported by the strong arms of Slum Soccer. However, the members of the organization are far from content. The minute we arrived they were proposing new challenges in order to take sport for development to a new level. Early on we decided that over the course of the week, we would take a step forward and teach games that would cover very intense issues such as menstruation. In many parts of rural India, there is little to no knowledge about the process of menstruation. In extreme cases, this means that women on their period are barred from entering the household because of fears that their menstrual blood will contaminate the food, water, plants, and other items in the home. Generally isolated in a shelter without food, water, and access to proper hygienic materials, thousands of young women die per year because of these myths. Additionally, 23 million women per year are forced drop out of school because of their period. Many of the women that we worked with in our time at Slum Soccer shared stories about how the lack of educational materials regarding menstruation has resulted in terrible consequences for themselves, loved ones, and other women. United under the leadership of full time CAC Coach Ashlyn, we worked to develop a number of games that teach women about the truths of menstruation through sport. Given Slum Soccer’s wide reach, we are hopeful that this will have a positive impact on many women’s lives. In my four months with CAC, I’ve found that in many cases, despite all of the hard work put in on-field, you don’t quite know if sport for development will ever fully “catch-on” and have the positive impacts that you are hoping for. However, upon the completion of the week with Slum Soccer, I felt supremely confident that our partnership would have a positive impact on many lives. This confidence was fueled by the fruitful discussions, ambitious leaders, and inspirational stories that I was fortunate to come across throughout the week. While at first, the little turf field in Maharashtra just seemed like a nice place to play, I now know that the field itself is only a smart part of Slum Soccer’s commitment to forgiveness, education, opportunity and creating a home to those like Homkant who were forced to leave everything behind. I can’t wait to see the results of CAC and Slum Soccer’s partnership in the coming years. December 19th 2018. 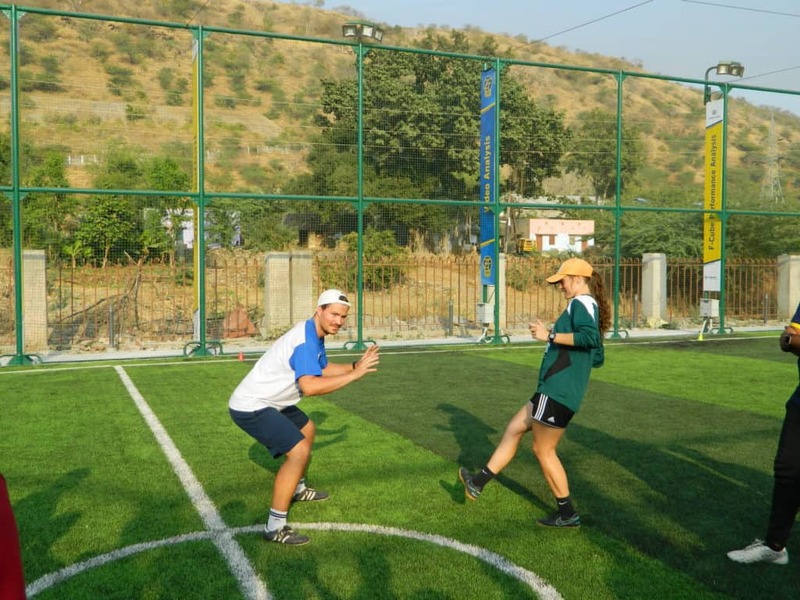 CAC Global Citizen Moritz Guertler discusses our week in Udaipur, India with The Football Link and Hindustan Zinc. Reflecting on our week in Rajasthan, I first need to enthuse over Udaipur – the city of lakes – or how some also refer to as the Venice of India. Please make sure to spend a couple of days in Udaipur when in this part of the world, it is full of culture, beautiful views, and palaces! Surrounded by hills and mountains, Udaipur lays within clear and clean lakes. After the city was founded in the 16th century, the ruler at that time increased the size of Pichola Lake by flooding the Picholi village, which gave the lake its name. A bit radical to upgrade your summer residence to say the least… Other than that Udaipur still has all the characteristics of an Indian city with cows blocking the traffic, continuous honking as well as the vibrant and busy buzz of daily life. For our program in Udaipur, Rajasthan we have been working together with The Football Link (TFL), the strategy and implementation partner of Hindustan Zinc’s CSR (Corporate Social Responsibility) initiative Zinc Football. Our team was well surprised about the all-new and state of the art football facilities located one hour outside of Udaipur right in the middle of Hindustan Zinc’s mining township. The idea behind TFL is to use the power of football for social development in Zinc’s mining communities. Together with TFL’s coaches we worked to lay ground towards a curriculum especially designed for boys and girls to play together outside any competitive environment. Focus topics for this week were social inclusion, gender equality, health & wellness, discipline, and – most importantly – a safe space for the kids to be themselves and have fun. Together with CAC’s flexible curriculum we adapted some games accordingly in order to tackle these aims, specifically. I deeply wish TFL all the best and success for the years to come. Together with Hindustan Zinc’s resources, the great and hard-working staff of TFL, and the passionate as well as energetic coaches the future looks bright for the youth in Hindustan Zinc’s mining communities. November 6th, 2018. 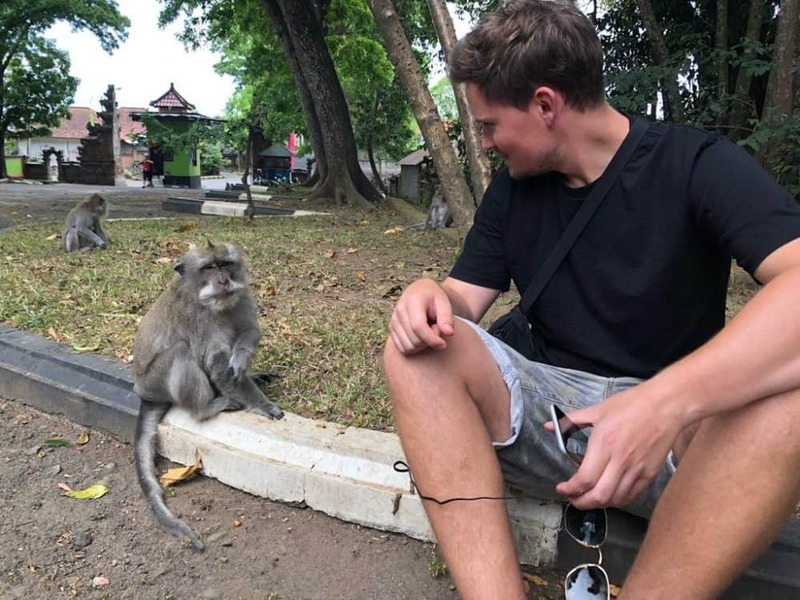 Global Citizen, Moritz Guertler from Germany reflects on his time working with CAC On-Field with Community Partner Uni Papua F.C. throughout Indonesia over the past month! The first and most overwhelming: getting picked up from Jakarta airport on a scooter (two guys, three backpacks) driving through the ultimate Asian urban jungle of vibrant, noisy, and dirty Jakarta, for 1h 30min after a 17-hour trip from Munich via Doha. The most difficult pitch: definitely in Tabanan, Bali – where the pitch was more of a sandpit than anything else with even a road for cars and scooters running THROUGH the pitch. 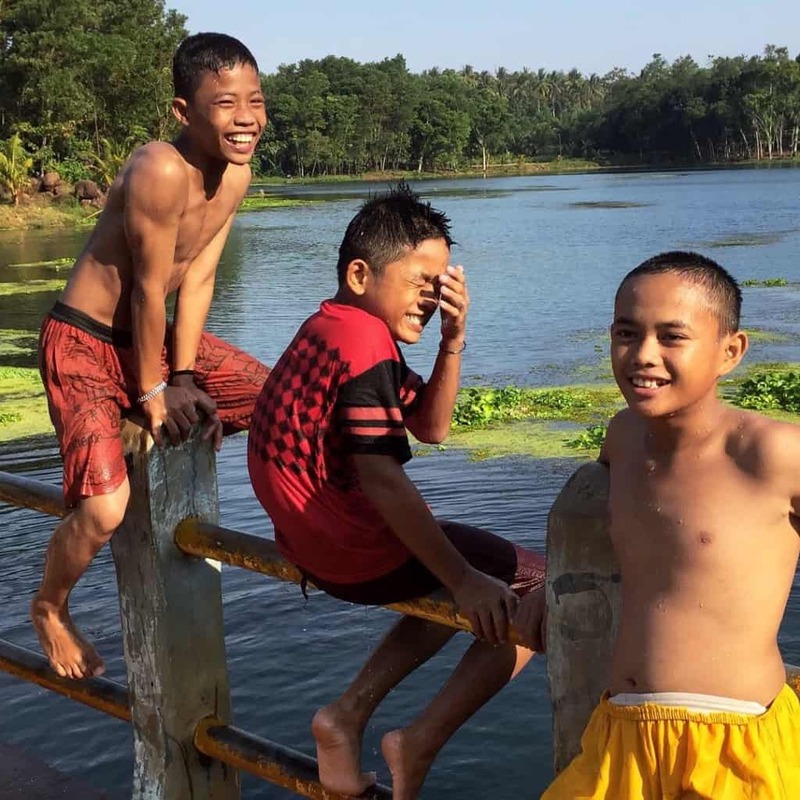 The most beautiful: Lampung’s countryside with jungle and clean rivers we got to swim in. The most surprising: the professionalism of staff and facilities of Tiga Naga Football Academy in Pekanbaru, Sumatra – a far above standard institution for young boys striving for a professional career in football in Indonesia. The strangest: witnessing a trance ritual (called Kuda Lumping; translated to ‘crazy horse’) in Lampung Timur, Sumatra: two women dressed up as animals in wooden masks and a tamer with a whip gave a very intense performance while a repeating series of drums, flute, and spell singing completed a dramatic and vibrant atmosphere, which causes form of trance for members of that ‘cult’. As the intensity and excitement rose among the audience, suddenly, spectators jumped into the circle obviously not being themselves, pretending to be animals crawling through the sand receiving higher spirits into their bodies. At the end of the ritual, the tamer lifts the spirits from the bodies and “brings them back”. They do not remember what happened afterwards. The most disappointing: missing three out of five days program in Bali due to one of Bali’s classics: the ‘Bali belly’ basically not allowing you to leave the bathroom for a couple of days. The happiest: being able to leave the bed again after almost missing out on the whole Bali project. The culinary highlight: definitely Pekanbaru, Sumatra, with its spicy and sweet-sour crab and shrimp, deliciously marinated fish, and the best grilled chicken I had in a very long time. The most nerve-wrecking: the roads between Lampung airport and the village where we coached that hardly deserve any name related to street, road, path or track – more potholes than actual road surface – in the complete darkness of the night. The best project: the last one in Tangerang Seletan, Java, since participants were so creative and fun to work with. The most touching: at the end of the last session in Jakarta, Benjamin, one of the participants, thanked me for the effort and heart I give to his country. The most impressive human being: Coach Frans from West Papua as the eldest of seven kids who volunteered many years for Uni Papua as a coach and, after he became a paid coach, financed his first brother’s university studies until he graduated with a bachelors degree just recently. My overall takeaways are the smiles of the people and the fun they had while playing these games. Don’t get me wrong here: I love football and enjoyed it all my life. But for me it was the first time to play games of football where the competition is not at the core like it has been throughout my football career. It is all about the social impact and the fun; and the fun is present every second – always! I definitely understand now better why football is called ‘The Beautiful Game’ – for me personally, football just gained a whole new dimension after these intense weeks. September 19th, 2018. Global Citizen Jesse DiLuzio writes about his first country on-field with Coaches Across Continents with Community Partner Reclaim Childhood in Jordan. My work with CAC began in Amman, Jordan where I was fortunate enough to work with coaches from a diverse group of countries that included Jordan, Somalia, Palestine, Lebanon and Syria! 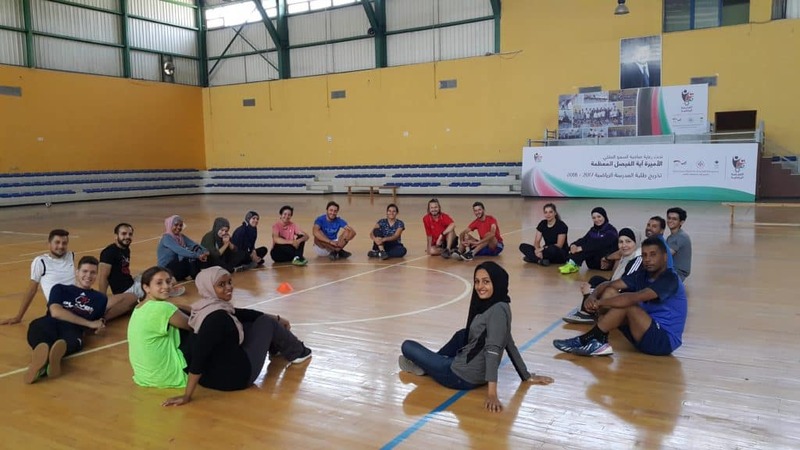 As part of this process, CAC partnered with a local non-profit called Reclaim Childhood, an organization that works to empower refugee and at-risk women and girls in Jordan through sport and play. 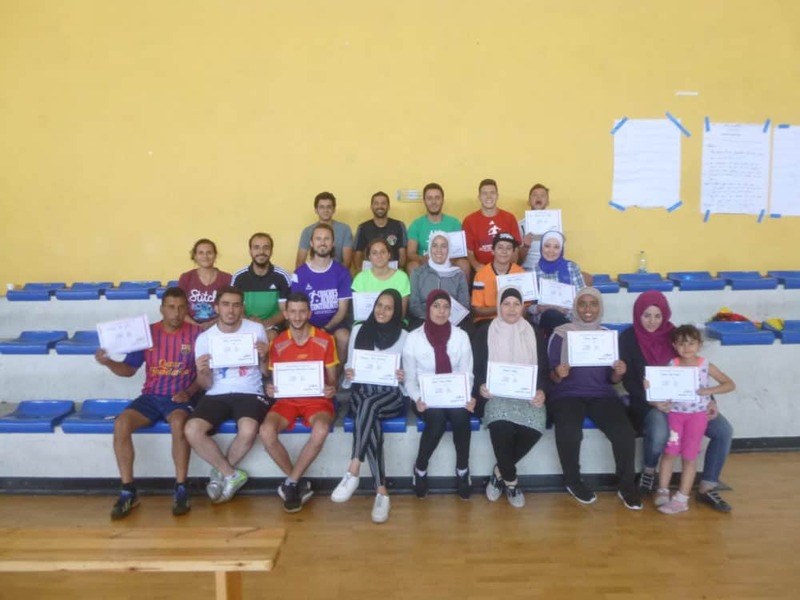 This partnership proved to be a fruitful one, and myself, Markus (full-time CAC Coach), and Rose (Community Impact Coach from Lebanon) were very fortunate to work with an incredible group of motivated coaches. Over the course of the week, we discussed a number of issues with a focus on rights for refugees and women in society. During these discussions, it became increasingly clear that many of the coaches in front of us were already great leaders in their communities. Haneen Khateeb, a female coach from Amman is one of these examples. Just last year, Haneen broke a world record through her participation in the highest-elevation soccer match ever played. At the summit of Mount Kilimanjaro, Haneen along with 29 other players representing 22 different countries played the 90 minute match 5,985 meters above sea level. As extraordinary as this feat was both physically and mentally, it is even more incredible when you consider the social impact of her actions. While the women’s football scene in Jordan has been much improved under the leadership of HRH Prince Ali, the role of women in sports has been a controversial topic across the region, where in some places, women are banned from participating in sports altogether. Haneen’s efforts served as an inspiration for thousands of women looking to overcome their obstacles and pursue their dreams. Other coaches that we trained also told us about the amazing efforts that they have put forth in order to provide a positive environment for other underserved groups. Muhammad (Yasin) and Paul, two friends from Amman, have effectively created a space in their homes for over one hundred refugees to discuss, challenge, and collectively overcome the many obstacles they face coming from corrupt, war-torn states such as Syria. Not to mention the incredible women who work with Reclaim Childhood throughout the year constantly recruiting underprivileged girls across Jordan to learn and play soccer in a space free from social pressure. While I entered the week eager and enthusiastic to provide and teach all of the things I have learned in 18 years as a soccer player/coach, I found myself doing quite the opposite. There’s a saying in Jordan that “whenever you are full, you can still eat forty more tidbits of food”. While I was always too full to test its validity during meals, I think this spirit was certainly embodied by the coaches that we worked with this week. Despite the fact that all of them had already accomplished incredible things in their communities, none of them were full. They always wanted to learn more, and their enthusiasm was unwavering. I became the listener, the learner, the “trainee”, as the coaches took the games/discussions that we led and took them to new heights. It was a humbling experience, one that put a lot of my previous assumptions about coaching into doubt. Off the field, the experience was quite wonderful as well! The locals in Amman are very hospitable and have warm hearts. They will feed you till you can’t move, talk to you until days end, and are always down for a coffee or two. Must haves for me are Shawarma from Saj’s, Falafel from Chammad’s?, Frike, Labaneh, and Mansaf from anywhere. Petra beer is pretty good as well. It was truly an amazing first week with Coaches Across Continents and I look forward to more travels with the organization!